The following is the gist of my introduction of Dr. William K. McElvaney, as he received the “Distinguished Alumnus Award” tonight from Perkins School of Theology. It includes some biographical info that I omitted, since it was also in the printed program, but that makes sense to include here. I am deeply honored that Bill invited me to present him tonight, and hope you enjoy it. 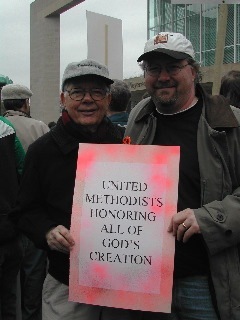 I have known William K McElvaney now for many year…as a student of his at Perkins, as a mentor of mine in my early ministry, and finally in his role as Emeritus Pastor of the church I serve, the church he once served: Northaven United Methodist. So I am deeply honored to introduce him tonight. Bill and Eric in 1990. With all apologies to the entire rest of the outstanding Perkins faculty, the thing I have always said about Bill is that he was my favorite professor. That’s absolutely true. I’m well beyond needing to score points with him. It was not just Bill’s teaching that inspired me. It was his life. His witness. His ministry. His personhood. It gave me: HOPE. And so, the hope Bill gave me was in something very specific: That you could be a white boy from North Dallas and still turn out OK. But here’s what Bill taught me: that you could be a son of great privilege and yet make the personal choice to be justice-centered, inclusive, welcoming of all races, genders, sexual orientations, and economic circumstances. One way of seeing Bill’s remarkable 50-year career is that he has constantly been answering these questions, again and again and again. Bill’s story starts here: in this great church in our connection (Highland Park UMC in Dallas). His family had deep ties to Dallas, and to Highland Park. His father was one of Dallas’ great civic leaders in his generation. During my Perkins days, I was also an undergraduate Hall Director, and used to take my meals across the street at the cafeteria in McElvaney Hall. Every day, I walked past the painting of Bill’s father which hangs in that Hall….you can clearly make out the family resemblance. And so, every day, I was reminded of Bill’s amazing journey. 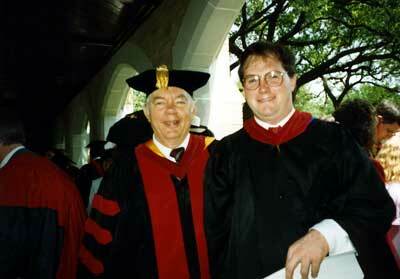 Because Bill started down that same path as his father…earning a business degree and an MBA. But three years into a business career, God tugged on his heart, and he was called into ministry. He graduated Perkins, did postgraduate work in at Union (in New York City), and served the church. 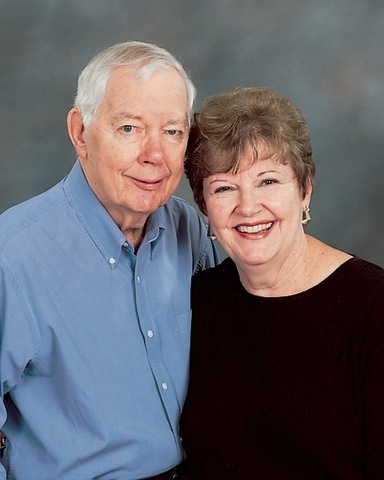 Bill was founding pastor at St. Stephen Methodist Church in Mesquite. He moved from there to Northaven, as Senior Pastor during the tumultuous late 60s and early 70s. So I want you to clearly note in this is just how wrong Scott Fitzgerald was. Not only did Bill McElvaney have a second act…he has had a third, fourth and fifth too. — Retired, twenty-year advocate for the oppressed and marginalized. I believe you must agree with me that few ministers you will ever know have such a diverse and unique arc to their career. Bill has served on boards such as the Maguire Center here at SMU, the Dallas Peace Center, The Wilkinson Center, Salud y Paz, The Greater Dallas Community of Churches, and many others. He’s the author of at least nine books that I could count, including his most recent “Becoming a Justice-Seeking Congregation,” based in large part on the ministries and people of Northaven Church. Bill and Fran in 2006. Bill and Fran founded the “McElvaney Award for Peace and Justice” given to SMU students that highly value these traits. And along the way, by his side all the time, is Fran. Fran and Bill are an amazing team. They are pastoral dynamos, constantly checking-in on members and friends, passionate about staying connected with the church. Fran is Bill’s constant companion, writing editor and has gradually…and every-so-slowly is saving him from being a social media luddite. Their love, their passion and zeal for each other and for serving the world, is an inspiration to us all. Bill and Fran have two children– John, who is with us tonight, and Shannon, who lives with her family in Massachusetts. And I love hearing Bill, over the years, speak lovingly of his children. To show just how much his life has changed, and with his permission, he’s allowed me to share with you a story of his life he once shared with me. As an undergraduate in the 1950s, just across campus here at SMU, Bill once stood among fraternity brothers and defended its segregationist admission policies. This was Bill, the young fraternity man. But just a a decade later, Rev. Bill McElvaney would be marching alongside a sea of African Americans, when Dr. King’s “Poor People’s March” came to Dallas. In fact, Bill was one of the only white preachers, one of the only white people, to march alongside African Americans that day, even against the desires of some Northaven members. You see, Bill McElvaney has always understood that God can transform lives. Even his. Bill continues to believe God can transform lives. So it as been, in more recent years, that Bill has been in passionate solidarity with the LGBT community. Because he understands that on this issue, God is still transforming lives. So complete is Bill’s love for the LGBT community, that he and Fran are “grandparents of choice” of several of Northaven’s LGBT families. I recall a recent sermon he preached at Northaven where –to protest General Conference, to stand in solidarity with LGBT community– Bill wordlessly took the stole from his neck, and placed it on the table– standing with those not allowed full participation in the church. The life and ministry Bill has led got him called “Communist” in more than one decade. (And that’s hard to do!) In a 1969 rally for peace, the marchers had been harassed all along the route by John Bircher-types calling them communists. When they arrived at Dealey Plaza, red paint was thrown on the speaker. It also got on Bill. And just a few years ago, while protesting something I won’t mention here, Bill was called out on “The Colbert Report” for being, and I quote, one of two “professors Lenin and Marx.” Of all the times Bill has ever been mentioned in the media (and there have been many) Bill says nothing generated that much talk and conversation. Called communist, for real, in the 60s; and in jest this decade. Here’s a picture of Bill and me at a large peace really, just before the beginning of the Iraq War in 2003. As pastor of St. Stephen, Bill helped lead an interfaith effort that desegregated the Mesquite Public Schools. Bill advocates for peace. But what I love about his witness for peace, is that he is passionate about non-violence. He has never been afraid to challenge Peace activists to be non-violent in all things. As President of St. Paul, Bill pushed faculty and staff, at all levels, to come together. He challenged the hierarchy that sometimes exists in higher education and ushered in an era where everyone…from the oldest tenured professor, to the youngest janitor…saw themselves as a part of God’s ministry team. As Preaching Professor at Perkins, Bill had layfolks from Dallas churches evaluate our “live” sermons. In class, we weren’t just preaching to a choir of seminarians and a professor…but to folks who would be in the pews. When Bill was pastor at Northaven, he helped to start a second-mile giving fund called “The Human Development Fund.” To this day it continues to give funds to many needy ministries in the Dallas area and beyond that deal with women, children, the poor. To date, this group has given close to a million dollars to worthy causes. But of all the things that Bill McElvaney taught me, believe it or not, the most important lessons he taught me have been pastoral, not prophetic. An early lesson he taught me, that I never have forgotten is this: before you can be prophet to the people, you must be their pastor. You must visit the people in the hospital, sit with them at the time of death, listen to them as their share their burdens. You see, during all these 50 years –during all these incredible social movements we’ve mentioned just now– Bill has also visited people. Up through the present day. He and Fran, and I often talk about Northaven folks who are sick and in need of prayer and healing. I have found this to be the truest, and most powerful thing he’s ever taught me. And, I will observe that over the years I have seen many colleagues fail to grasp the simple, but deep, importance of this; and, sadly, suffer consequences because of it. Finally, let me share with you that Bill McElvaney was the first teacher I ever saw cry. It was November 1989, and I was walking across campus, right out front of Perkins Chapel, and he was coming back the other direction. And he was in tears. He had just heard of the murder of the six Jesuit Priest in El Salvador, and their two coworkers. And I remember being deeply moved that this professor could be so moved by the murder of people thousands of miles away. But you see, Bill always allowed his life to be changed …in Mesquite, at Northaven, in Kansas City, at Perkins. He allowed his life to be changed by his ministry for and with African Americans in the 60s, Immigrants and the Poor in Central America in the 80s, LGBT persons in the 90s and today. Because he has allowed his life to be changed, God has used him to change our world for God. It’s a lesson for us all, really.